Photographer's Comments: This is a photo of my son popping off one of those champagne bottle poppers on the Fourth of July last year. I hate the holiday because fireworks scare the living daylight out of me, so this is as far as we go to celebrate. 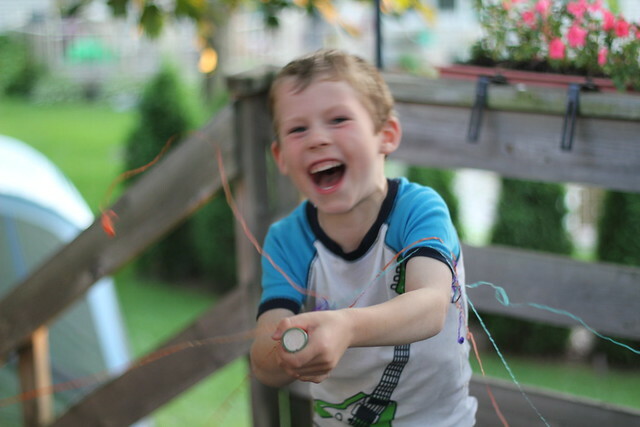 I think the photo shows two emotions - one being the excitement on my son's face at his popper exploding and two my own emotion of fear from the popper shown through the shakiness of the camera and the lack of focus in the photo. I'm pretty sure I edited the photo's exposure and maybe color saturation through picnik when I uploaded it to flickr. Our classmates are asked to provide constructive feedback on the photos and the instructor also does the same. Can't wait to get my first comments!